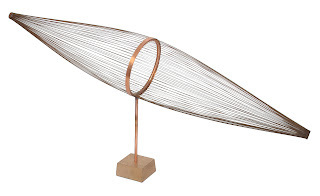 REALLY GOOD STUFF: BERTOIA wire form or "Zepplin"
So I picked up this super early Harry Bertoia wire form last month. A really incredible piece. This pre-dates Harry's later stainless wire forms and was the basis of many future works. The piece is comprised of numerous metal wires that are brazed at both ends . One side has a copper washer , the other an open weld. The ring in the middle and display base was created by Harry's son Val last year. It is not an original part of the sculpture and it is rather noticeable as the middle is copper and bright. I wonder how this was actually shown when produced. The later ring makes sense to hold the wires in place but when it was welded originally in the 1950's was there a ring that provided the support that this later piece did? At any rate the piece is pretty interesting and really beautiful in it's simplicity and technique.